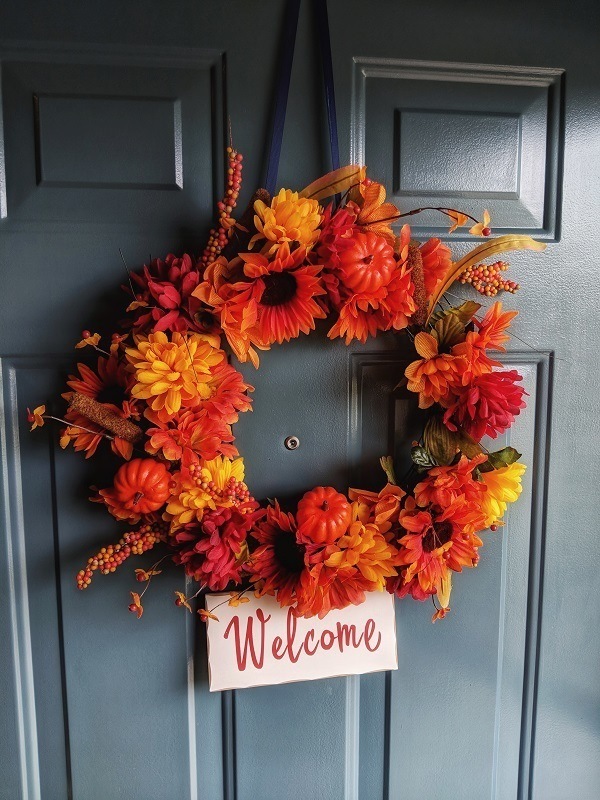 Looking for DIY Fall wreath ideas for your front door? Make this colorful, Fall wreath for only $12 in supplies! Note: This blog is part of a special Fall Blog Hop that I'm doing with a group of talented interior decorator bloggers. We hope you are inspired by our Fall creations. Stick around to the end of the post to see what's next! If you're coming over from Laura at Harper Home Designs, welcome! You can purchase the items for your wreath anywhere. I chose Dollar Tree because I was trying to create a wreath for less. Other options for faux florals could include Hobby Lobby, JoAnn Fabrics, Michaels or even from faux greenery or flowers that you already have on hand. Think about creating your wreath from old wreaths or arrangements that you no longer like, or even items that you find at Goodwill or a garage sale. These were some of the artificial flowers I purchased from Dollar Tree to make my wreath. To create the wreath, first I cut the 7 bunches of flowers into individual flowers using a wire cutter (which I had on hand). The good thing about these artificial flowers is that they come with between three and six separate flower stems. Therefore, you can separate them and get many more flowers for your dollar. My wreath includes a few bunches of burgundy dahlias, orange daisies, and orange and yellow peonies, along with some leaves and berries. Dollar Tree has faux floral stems in colors like this burgundy one in summer and Fall. Separating the bunches makes it easier to disperse the various flowers evenly around the wreath form. Scissors will work, but not well to cut through the wire because it’s pretty thick. Trust me on this one, and your hands will thank you later! If you don’t have wire cutters, you could alternatively use something sharper than scissors, such as nail clippers, in a pinch. Then you’ll want to kind of plan out how you want to lay out your wreath, given the existing stems and colors that you have. This will ensure that you have enough flowers to go around the wreath, and also that you won’t end up with too many of one color at the end of your supply of flowers. Next, I alternated each type of flower by wrapping them around the wreath form and attaching each one to the form with floral wire. This is the trickiest part, only because my flowers didn’t always want to cooperate! If you’ve ever made a wreath, you’ll understand this one. 🙂 This is why I always use the wire and wrap it around to secure the flowers to the wreath. As I mentioned, all of the flower and supply items to create the wreath were $1 or less. Therefore, my total cost to create the wreath was $12. The time to assemble the wreath was around 30 minutes. This was actually a project I did while sitting on the couch watching TV in two different sessions. It was so easy and dare I say, fun to do. I highly recommend creating your own wreath rather than purchasing one from the store. If you’ve ever shopped for wreaths, they can be as much as $30 to $50 or even more, depending on how large they are or from what materials they are made. Now, if you are looking for more of a high-end look, and dollar store flowers just don’t cut it, I have another suggestion. Simply visit your local hobby or craft store and browse their faux floral displays for the right type of greenery and flowers to make your arrangement. These stores almost always discount their floral bunches from 25 to 60 percent. You just have to watch for the right sale. Another option is to look in local newspapers, online or on discount apps for coupons to use when you shop. You should never have to pay full, retail price for your faux flowers or greenery. This should reduce the cost to create your wreath substantially. My front door wreath for Fall - looking into my entryway. (This picture was taken before I found the mini pumpkins, which I added later). I have gotten lots of compliments on my wreath. Maybe it’s not everyone’s taste, but you could do you with your own, favorite colors or even objects that fit your theme or the season. The point is that you can create your own wreath rather than buying one, and it’s a lot easier and less expensive than you might think. And thank you for reading our Fall Blog Hop! Now head on over to Laila Belles for some more amazing fall inspo! Love your DIY for a budget friendly fall wreath!! I have a few dollar store wreaths as well! They are so easy and so budget friendly. Love this fall wreath you’ve created here. What a beautiful wreath. I love the colors and how it pops off your front door. Your home is so pretty Susan. Have a wonderful day! Such a pretty wreath my friend! Nicely done. Susan the wreath is so pretty. I didn’t know the dollar store had such nice stems! I will definitely be checking it out. Thanks so much! This is such a wonderful DIY!! Love this darling and simple craft Susan! Pretty fall colors in the wreath so perfect for home!